Bertema "Ascend to The Throne" Prasmul Olympics yang Keenam Siap Digelar. Guys, Yuk Ramaikan! 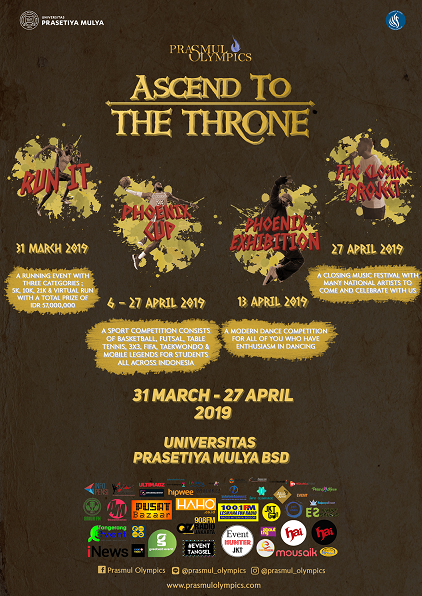 Bertema “Ascend to The Throne” Prasmul Olympics yang Keenam Siap Digelar. Guys, Yuk Ramaikan! RUN IT is a serious run program which is the part of Prasmul Olympics 2019 with track categories from 5 (five) kilometers, 10 (ten) kilometers, also introducing our newest category, 21 (twenty-one kilometers) as a half marathon, and is opened for public. Register yourself immediately or your community and win the total prize of 57 million rupiahs! A series of sports competitions that consist of six categories: basketball, futsal, Taekwondo, table tennis, FIFA ’18, and Mobile Legends. In this event, there are 3 participant categories: university, senior high school, and public in general. 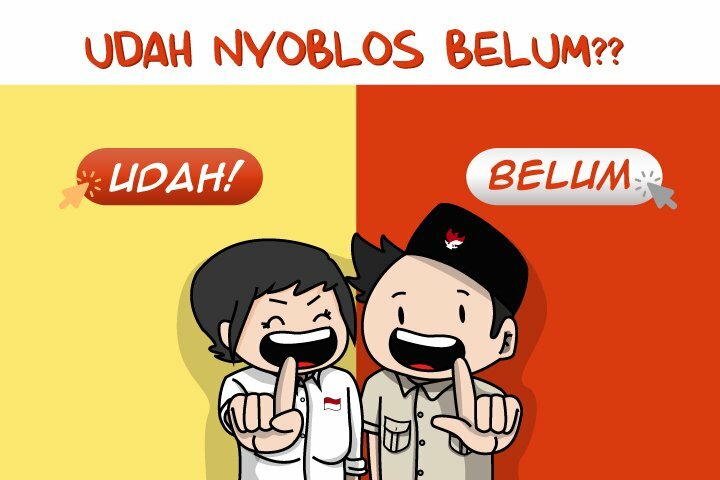 This is for Jabodetabek region. Phoenix Exhibition is an art competition of Prasmul Olympics 2019, which is a modern dance competition. 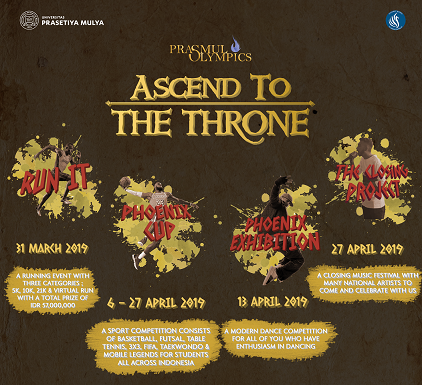 Modern dance competition of Prasmul Olympics 2019 has the theme “Define Your Throne”, which means the way you express yourself through dance motions. The modern dance competition will be held in 3 categories: senior high school, public in general, and the dance battle which will be held in 1 day. The Closing Project is the closing ceremony of Prasmul Olympics 2019 as the last event in Prasmul Olympics 2019. The event is held as a form of celebration towards the participants and as a form of gratitude for their participation through the Phoenix Cup and Phoenix Exhibition of Prasmul Olympics 2019. The Closing Project is enlivened by presenting several famous singers in the closing ceremony, which is opened for public. First, we have Glenn Fredly, and there are much more performers we will soon announce. WHERE? At Kampus Prasetiya Mulya BSD, Edutown, Kavling Edutown I No. 1 Jl. BSD Raya Barat I, BSD City – South Tangerang. Don’t forget to check our Instagram @prasmul_olympics. See you at the gate and rule your throne! Bertema ‘The Greatest Weekend’ LOL.YK 2018 Segera Dilegar. Guys, Yuk Ramaikan! Bertema ‘Negara Mawa Tata, Jazz Mawa Cara’ Ngayogjazz 2018 Siap Digelar. Yuk Ramaikan! Bertema Empowering Digital Transformation, Konferensi Internasional CHIuXID Siap Digelar. Yuk Ikutan! Bertajuk “Beauty Bestie”, Event Kolaborasi Emina ft. Hipwee Siap Digelar. Girls, Yuk Ramaikan! Mengangkat Tema Women Empowerment, Jannah Fest 2018 Segera Digelar. Girls, Yuk Ramaikan! 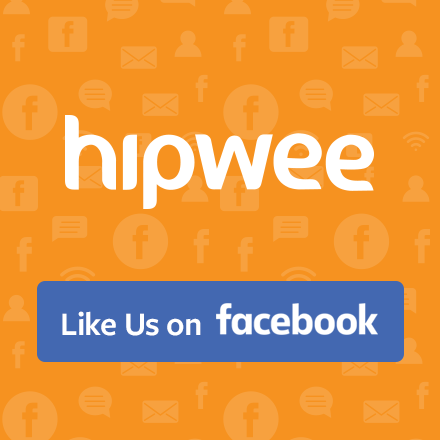 Inilah 5 Kontributor Terbaik Hipwee Bulan Oktober Lalu, Manakah yang Jadi Favoritmu? Bertema “Make Your Own Tea” Jagapati.com Adakan Fun Class Meracik Teh Sendiri. Seru Banget deh!